The Interview Process: Making the Most of Your Time and Talent – Giving Tree Associates, Inc. Welcome back to our series on search and hiring. In my last post, we discussed the development of a strong job description and talked about why this document might be your most important recruiting tool. 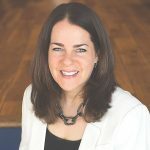 I’d like to continue talking about the hiring process from the organization’s perspective (I promise I will get to the candidate’s perspective in the next few weeks!). Let’s think together about how to manage applications, candidates and interviews. This process can be extremely time consuming and even sometimes frustrating, because it is becoming increasingly common for candidates to take up (your) time with phone interviews and email conversations only to “ghost” you (i.e., no show) for the actual in-person interview. So how do we make the best use of our time and sniff out candidates who are less than serious about your organization? Let’s start with the application process. Depending on the job, we may see anywhere from 30 – 100 resumes come in for a single position posting. How do we pare these down? Identify key words, experience, and qualifications. There is software that searches resumes for key words, but I am guessing you don’t have it. And the truth is that it’s not hard to establish a few key priorities in terms of work experience, educational background, training and/or other credentials and then read resumes through a lens that seeks to filter with that criteria. My team can do this very quickly, but it takes practice. Bottom line, either write down or verbalize your top 4 or 5 non-negotiable traits, experiences, characteristics or qualifications and then discard resumes that do not include them. Typos are a bad sign – period. If I see typos in a cover letter or resume, I generally throw it out no matter how impressed I am with a candidate’s experience or background. If they cannot take the time to proof read their resume or cover letter, chances are they will not be detailed enough (as your employee) to take the time to do so with your critical communications. Choose a hiring partner and cross reference your top hits. 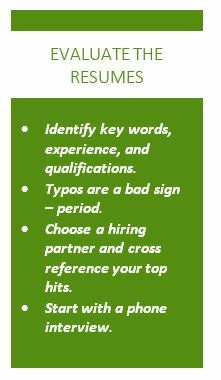 I generally choose another person on my team to go through the same set of resumes I have reviewed (with the same criteria). I then look at our “yes” piles for overlap. If both my partner and I have agreed on candidates who look like they are worthy of a phone interview, I know that I have probably made the right choice. I then discard those who only one of us deemed qualified (unless I decide I have a good reason to break that rule!). Start with a phone interview. I almost NEVER bring in a candidate to meet with me in- person based on the strength of their resume. I always start with a phone interview. It simply saves time and is a great way to weed out those who looked good on paper but have a hard time putting articulate thoughts and sentences together on the phone. It is much harder to end an in-person meeting at the 10-minute mark (when you determine they are not a good match) than it is to cut a phone call short. Phone screenings are the best way to filter your candidate pool with a quick and efficient conversation. If you are impressed on the phone, you can then choose to interview via video conference or in-person meeting. Once you move to the in-person meeting round you’ll want to make the most of the candidate’s time in the office. I typically set up a system (well in advance of meeting) that capitalizes on an opportunity for strong candidates to meet others in the office ONLY if the interview with me (or the hiring manager) goes well. If the first meeting of the day does not go well, I may not offer time with additional staff members. I also let candidates know well in advance of the meeting that the interview process may involve more than one meeting (so that they can plan to spend extra time in the office). Generally, current staff members appreciate the opportunity to meet those who may become colleagues and provide feedback. Be sure to clarify their role in the process (are they in a decision making role or rather one where their feedback is sought?). 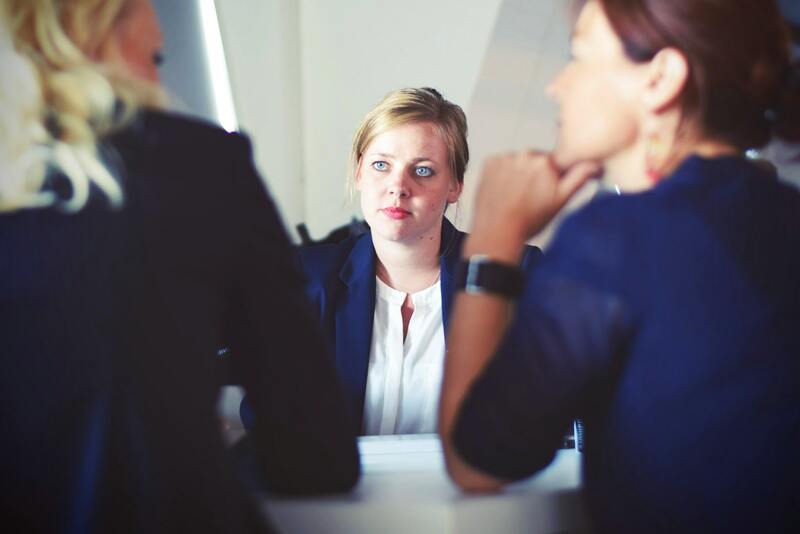 Decide in advance what you are looking to achieve with each round of interviews and determine when, if ever, you will include lay leadership in the process. Last, be sure to treat each candidate with respect. Communicate in a timely fashion and be sure to respond in some manner to everyone who applies, even if it’s just to say you received their application. Let unsuccessful candidates know you have moved in a different direction so that they can proceed with their job search. Extend to them the same courtesy you would hope for as a candidate – this reflects well for the organization. Stay tuned in two weeks for more on the actual interview conversation – we’ll cover what to say, what not to say, and how to identify your top prospect. We’ll even provide you with sample interview questions! And in the meantime, please enjoy this freebie – an executive search timeline to keep you on track during your search process. If you have any questions about nonprofit executive search or anything related to managing a fundraising campaign, please submit your questions and tune into Facebook on Tuesdays when I answer these questions.